Duration for goat pregnancy is up to around 150 days and consist of three stages which are breeding, early gestation, and the last is late gestation. Pregnant doe needs special treatment and supervision from you. If you can start to give pregnancy treatment as early as you can, the better your doe can become! But of course, the first thing that you need to do is to tell is your goat is pregnant or not. All pregnant goats show some visible signs. Trying to figure out if your goat is actually pregnant or not can be tricky and harder than you think because apparently, it’s not only about their stomach’s sizes (they naturally have large size stomachs, due to the activity in their digestive system) but also their behavior and other appearance changes. Learning to recognize goat pregnancy can take time and effort but this is good knowledge for you and to let your goat (and also yourself) be well prepared. Knowing these 8 sign first will make it easier for you to notice goat pregnancy. 1. They are not returning to the heat phase. Notice the right time of the breeding season for dairy goats so you can figure out when your doe probably is in their heat phase. With this, you will able to tell if your goat is actually pregnant or not. Your does should not showing any symptoms of heat such as cervical mucus, wagging tail, or being louder than their usual behavior. If they get pregnant, they will not come back into this phase. You can also tell by putting your doe with buck because if the doe has been successfully bred, the doe will show no interest. 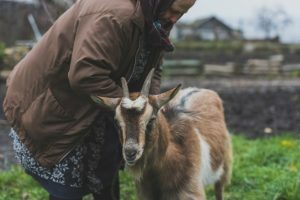 Here is an article about how to Keep Your Goat at Backyard. The appetite of a pregnant doe will gradually increase, but milk production may decrease. Doe will stop producing milk around less than 120 days after it was bred to give her body a time to rest before the labor comes. Your doe can be a lot more aggressive when pregnant. Some often experience a personality reversal. For example, if the doe is usually a good girl and friendly one, on their pregnancy, the doe may become more aggressive, cranky, and eager to fight back when being provoked. This trait is because hormone progesterone that has been produced when your doe is settled. But that’s okay! This change is only for temporary. Not only happen to the doe, but you will also notice some changes in the breeder buck towards the doe. They will become more aggressive, or even become more friendly depend on their usual behavior. The development of the fetus may also affect your doe’s shape. The fetus (or fetuses!) may press into the doe’s rumen, hence making a rounded swelling on the left side as well as its right side so the doe looks like it has a boat-like shape. But in other cases, the doe can also barely show any change on its appearance until about six weeks before the labor. Your doe’s stomach, specifically in front of its udder, will tighten after two until six weeks of post-breeding and then will be about 2 inches bigger after 12 weeks of post-breeding. If you press your fingers gently against it, your doe’s stomach might feel tight and tense, not as soft as usual. To help you out, better for you to start measuring your doe’s belly just after the breeding so you have a better scale and able to tell if there’s any change on the doe’s belly. If this is your doe’s first goat pregnancy, her udder should also begin to swell and gradually develop until finally form into a nicely rounded udder. If your doe is pregnant, your doe’s tail ligament will loosen, soften, and begin to disappear. The usual ligament is quite firm but because of pregnancy, you can feel the tail ligament become soften. The ligament is one either side of the tail that feels rubber-band. You can feel the tail ligaments by placing your hand on the top of the doe’s rump with your fingers facing toward the tail and press it firmly. As labor gets closer, doe’s tail appearance will also become a bit crooked until after the delivery. After three and a half months, you may able to feel the movement of the baby in your doe’s belly, especially if your doe is carrying more than one baby. You can see or feel the baby kicking if you put your hand on its right side of the belly, not on the left side because if you feel something kicking from the left one it probably comes from the rumen of doe. Having these 8 ways to recognize that your goat is pregnant or not can be a valuable lesson for you and your doe so you can aware and prepare better. Again, recognizing the signs from your goat can be harder than you think because it probably has different cases from different goats. You may need a little more practice so you can notice the signs easily. Heatly doe for a healthy baby! For further information that may help you later, also read about Tips to Care for Pregnant Goat and How to Raise Born Goat.